Hsieh, Tony. 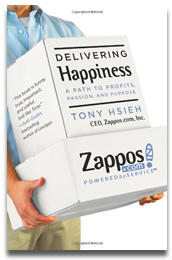 Delivering happiness : a path to profits, passion, and purpose. Business Plus, 2010. Monday evening, a new pair of Dansko clogs appeared at my door. I had ordered them two days earlier from Zappos.com. Any customer will tell you that Zappos has great selection, free shipping and problem-free returns. But the reason that customers keep coming back is their service. Entrepreneur Tony Hsieh, CEO of Zappos.com, has written a new book, part autobiography, part company history, part business advisory. He tells how he built a dot com business, LinkExchange, which he sold in Microsoft for $265 million, when he was only 24 years old. Then he used the money to fund a start-up, Zappos.com. Most of the book is the tale about Zappos, how the company survived on the brink of bankruptcy for years, barely making payroll, then became an overnight success. Author Hsieh explains that he cultivated his business by combining profits, passion and purpose. He says his company was successful because they invested their time and money into three areas: into customer service to build the brand; into corporate culture and development of core values; and into employee training and development. Hsieh feels that those three areas are Zappos.com’s only competitive advantages in the long run. The book closes in 2009, the year that Fortune rated Zappos as one of the best companies to work for. That same year, Amazon.com acquired Zappos for $1.2 billion. Hsieh explains how he made that happen in this entertaining and easy read. Our Business Insights and MarketLine databases have been merged into a new product, Datamonitor 360. Business Insights is no longer available as a standalone product, and MarketLine will no longer be available as a standalone database after December 31, 2010. Datamonitor 360 contains full text market research reports focusing on companies and broad industry sectors: consumer goods, energy, finance, health care, and technology. Market analysis and forecasting looks at major issues and threats for each sector with analytical commentary and data. If you have any questions about Datamonitor 360 or MarketLine, please feel free to contact us. Three new books about the men (and yes, they are all men), who made millions manipulating money — from the first investment bank in the early 20th century to the hedge fund boom and bust days at the millennium. When money was in fashion : Henry Goldman, Goldman Sachs, and the founding of Wall Street. by June Breton Fisher. Palgrave Macmillan, 2010. Henry Goldman’s granddaughter unfolds the story of the Goldman dynasty, their investment banking business, and the fights and feuds with the Sachs family. The book includes many details about family and society, interwoven with historical events of the era, as well as stories about Henry’s famous friends, including Einstein and FDR. High financier : the lives and time of Siegmund Warburg. by Niall Ferguson. Penguin Press, 2010. London investment banker Siegmund Warburg is credited with the first hostile takeover bid ever in 1959, and for creating the Eurobond market in 1963, largely to circumvent controls. 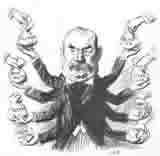 He was instrumental in reestablishing London as a global financial center. Renowned historian Niall Ferguson recounts the life and times of a private and powerful man in this authoritative biography. More money than God : hedge funds and the making of a new elite. by Sebastian Mallaby. Penguin Press, 2010. Using interlocking stories about real life Masters of the Universe, this history of hedge funds profiles the men who gambled on their ability to spot market opportunities that others missed. The author concludes that today’s hedge funds deliver value to the investor; they are not too big to fail; and they are more likely to be contrarian than other types of investors — but as hedge funds grow, so does the risk to the global financial system. Thank you for taking the time to complete the Ford Library’s survey. We were delighted that 145 of you responded to our questionnaire! Noise complaints. A number of you pointed out that the library can get rather noisy. Remember that the library is the only space in Fuqua reserved for quiet study. Please be considerate of your neighbors and remember to switch your phone to vibrate when entering the library. Phone calls can be taken outside the library or into the back photocopy room. Group study space is available in the team rooms located around Fuqua. Additional study space. A number of you requested additional seating, particularly near the windows. We are currently working with the Fuqua Administration to consider strategies for adding more study space to the library. Updates will be shared as they become available. Library Hours. Some of you requested additional library hours. Unfortunately, the library’s budget does not have the flexibility for the additional staffing cost that being open 24/7 would require. However, we are keeping track of the number of students in the library at various points in the day and week and using that data to assess the need for additional hours. In particular, there seems to be a need for extended hours around exam time. Hence, we plan to adjust our hours accordingly. We truly appreciate the helpful feedback that you provided in the library survey. Please feel free to use the Ford Library Suggestion Box should you have additional comments to share. 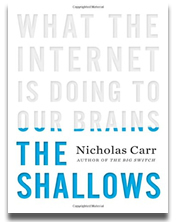 Carr, Nicholas G. The shallows : what the Internet is doing to our brains. Norton, 2010. Technology writer Nicholas Carr’s new work is about the effect of the Internet on our brains. Carr argues that the calm, focused minds of book readers are being replaced by a new mind that takes in information in intense disjointed bursts. This new mind of the internet user is easily distracted, and finds it difficult to pay attention and to engage in learning. For centuries, printed books have been the foundation of our culture. Soon after Gutenberg’s invention made books inexpensive, reading became the primary means of exchanging knowledge and experience. The act of reading a book required sustained attention to a static object. Engaging deeply with written words was not a natural state for human beings and our brains needed years of training to do it effectively. The practice of reading changed the physical structure of our brains, promoting our ability to think deeply and creatively. These two titles prove that technological innovation and insight can be “locally grown” in our market of ideas just down the road from Durham, in Research Triangle Park and Raleigh, NC. Brilliant: Shuji Nakamura and the revolution in lighting technology. by Bob Johnstone. Prometheus Books, 2007..
Inspirational story of a young researcher from rural Japan, who invented the technology that underlies the solid-state lighting industry, energy-saving LED’s. After an impressive string of achievements in semiconductor research, he left his Japanese company, which then sued him for leaking trade secrets to Cree Research, based in Research Triangle Park, NC. 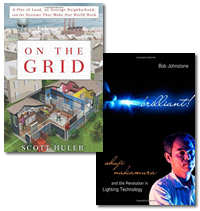 On the grid : a plot of land, an average neighborhood, and the systems that make our world work. by Scott Huler. Rodale / McMillan, 2010. Beginning with the systems in his Raleigh, NC home, author Scott Huler investigates the infrastructure and the workers who make his existence livable. He discusses water, electricity, and the internet; sewage removal; street and highway construction, while providing insight into why this complicated structure doesn’t collapse, or why it works as well as it does. Ah autumn – the brilliant foliage, the crisp evening air, the smell of burning leaves, the many students beginning their job search. Yes, it’s that time of year when the thought on many minds is where will I work, and my advice begins with Onesource. A jack-of-all-trades database, Onesource allows students to build a list of companies meeting their needs for where they want to work, which industry, how large or small, and/or whether the headquarters are in the US with subsidiaries in Tahiti. From that list, they can download the list and include data such as location, size, and officers names’ and titles. Though Onesource can’t tell you if there’s a job opening within a company, it can help you pinpoint your search to a select list. Need more information? Feel free to ask us now.